We are a leading wasp nest removal and pest control specialist across Bournemouth, Poole, Blandford, Ringwood, Wareham and Dorchester. Combating a wasp nest is a task that requires skills, expertise and most importantly – protective clothing and equipment. Ensure that your home or commercial property is pest-free with our expert wasp removal service. 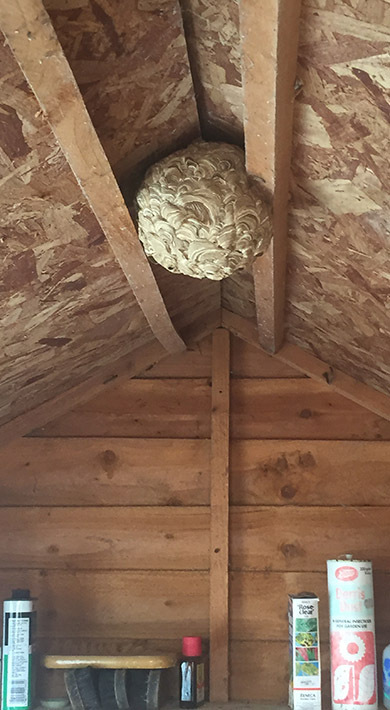 What’s involved in our Wasp Nest Removal service? Once we have confirmed that they are wasps then we aim to be with you within 90 minutes of the initial call. It’s vitally important that you contact a pest control expert immediately as a single sting can be extremely painful and, in some, result in Anaphylaxis shock. Before entering the space, our operators put on a full protective suit, mask and gloves to ensure their safety from potential stings. We will treat the area with an insecticide, which will begin work to eradicate the problem. Why choose our Wasp Nest Removal service? When your health is potentially at risk, you’ll want to ensure that the people getting rid of your wasp infestation are qualified to do so. All our pest control operators are fully-insured, fully-qualified and ready to deal with your pest problems 7 days a week. We also understand that value for money is important for our customers, which is why we will beat any like for like quote that you bring us to ensure that you are getting the best wasp nest removal service in Dorset and West Hampshire for the best price. Contact us on 0800 1455762 to get started. Late in the summer, the queen of some species will produce unfertilised eggs. These will develop into males. The males will fertilise the wasps that will become queens of the following year. These fertilised females will overwinter in a sheltered location. In most cases, the rest of the colony will perish when winter comes. Next spring, the queen will start laying eggs. The fertilised eggs that they produce will become workers, building the nest and feeding the larvae produced by the queen. A single nest can contain up to 7000 wasps at a time and up to 30,000 wasps in a year. Ready to get your wasp nest issue resolved once and for all? Contact our pest control experts in your area on 0800 1455762. Why choose our loft clearance service? When your health is potentially at risk, you’ll want to ensure that the people getting rid of your pest infestation are qualified to do so. All our pest control operators are fully-insured, fully-qualified and ready to deal with your pest problems 7 days a week. Do you have a wasp infestation that needs sorting quickly? Contact on 0800 1455762 to speak to one of our pest control specialists!